Tuck Pointing, Brick and Chimney Repair Toronto | Turnbull Masonry Ltd > Blog > Blog > Can You Repair Cracked Bricks? Question: Help, my bricks are cracking! Can they be fixed? If the bricks on your Toronto home or business are cracking there are solutions that will work to fix the problem. The actual solution depends on the extent of the damage. In most cases, brick cracks that surface on the front facing exterior wall are fixable. Brick cracks are generally caused by internal or external pressure. Cracked bricks are often much more than just an aesthetic problem, but a potential sign of larger structural damage. That’s why it’s just as important to find the underlying issue, as it is to fix the actual crack. 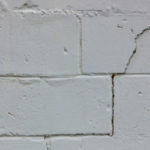 It is not uncommon for people to try and use fillers to patch up cracked bricks, but this won’t necessarily do the trick and cracks could very well continue to surface. That’s because the cause of the crack is not addressed by simply filling in the fissures. It’s important to ensure there are no serious structural issues impacting the structure. Ignoring mortar damage. 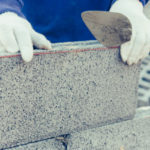 If the mortar is cracked, it can be repaired with a simple process known as repointing. 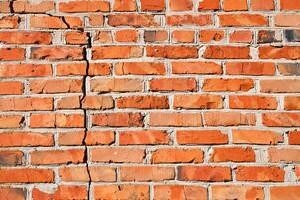 If bricks are cracked that typically means the damage has extended past the mortar. 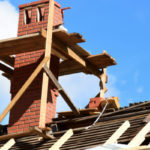 It is easier to fix cracked or crumbling mortar as opposed to bricks, but if mortar damage goes ignored for too long bricks are bound to damage. Thermal expansion. When the wall is regularly exposed to the hot sun the wall actually expands. Over time, this expansion causes cracks to form. Freeze and thaw cycles. When the wall is placed under pressure due to temperature fluctuations between hot and cold, it is at risk for cracking. This is because any water trapped in the wall freezes and then thaws, putting considerable pressure on bricks. Over time this pressure results in cracks. Vines or other foliage growing through bricks. If you try and remove the vines by pulling on them it will cause the surrounding bricks to crumble and crack. The greenery puts additional moisture into the bricks, which makes them far more sensitive. Foundation issues, if your foundation shifts out of place it can easily cause bricks to crack. Preventing cracked bricks starts with the building process. Connectors should be properly selected and applied, as well as installation of thermal expansion joints. The actual foundation should also be properly constructed so that the risk of water damage and uneven settling is reduced. If you notice cracked or crumbling bricks it’s extremely important to call out a professional as soon as possible to assess the damage. If the issue is related to something like an unstable foundation you want to act as quickly as possible to address the issue. Is just one brick cracked? Or, do you notice a pattern of cracking bricks on one single wall? Your answer is very telling in regards to the type of damage you are looking at. Horizontal Brick Cracks: If you notice brick cracks moving in a horizontal direction you may be looking at a symptom of foundation failure. This is generally caused by the soil beneath your home actually pressing against the foundation. As a result, this causes the walls to literally cave inwards. If left ignored, these cracks will increase until the wall completely collapses. Vertical Brick Cracks: This is yet another common sign of foundation failure. Vertical cracks indicate your home is shifting. Changes in soil will cause the foundation to shift out of place. This leads to vertical cracks in bricks and other issues such as sagging floors. Stair-Step Brick Cracks: If you notice cracks in bricks follow a pattern that resembles stair steps this is a sign that your house is unevenly settling. If your bricks are cracked due to foundational issues you must fix the underlying issue ASAP. Otherwise, no cosmetic fixes applied to bricks will be of any use. 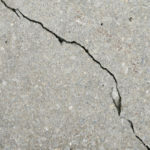 The cracks will reappear and your home’s foundation will continue to deteriorate. If you are concerned about your home’s foundation, call Turnbull Masonry today. We are happy to come out inspect the damage and give you a quote, along with some peace of mind. If just one brick or a few bricks spread throughout the same structure are cracked, chances are it has nothing to do with foundation issues. This is good because it means you only need to fix the bricks and surrounding mortar as opposed to an issue with your foundation. Bricks and mortar can be removed and replaced with matching materials to create a flawless look that restores the overall stability of your structure. No matter the cause of your cracked bricks, Turnbull Masonry has the experience, tools and expertise to fix it to like new. Call us today for competitive prices and superior work!